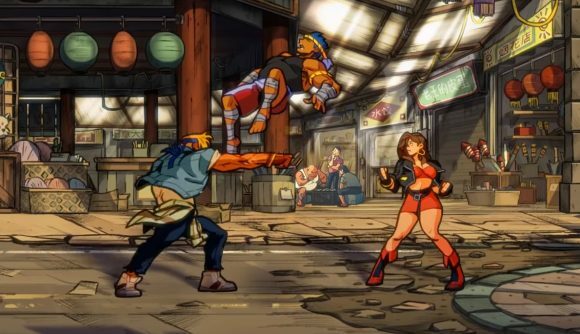 After an all-too-short reveal trailer last year, Dotemu has provided a slightly more substantial look at Streets of Rage 4 gameplay. Though it’s still only a teasing taste, it does give us a better idea of what to expect from the new gameplay features and refreshed art style – and it gives us the tiniest hint toward some familiar music. The game’s art direction is being handled by Lizardcube, which previously handled the Wonder Boy: The Dragon’s Trap remake – and the art and animation results here are similarly gorgeous. It’s a far cry from the excellent pixel art of the originals, but the style here looks to effectively modernise that look and present something new. Its brawling looks familiar, but it seems there are some new options to be found. The trailer puts a lot of emphasis on juggles, as Axel and Blaze knock foes into the air and toss them back and forth for cooperative juggle combos. The fights are coming courtesy of Guard Crush Games, which put out the bizarre but excellent Streets of Fury a few years ago. A couple of new silhouettes have appeared in the art at the end of the trailer, too, which suggests we might get a couple of additional playable characters. One character’s big and muscular with a robotic arm, while the other seems to be equipped with a guitar. You can see the trailer for yourself above.